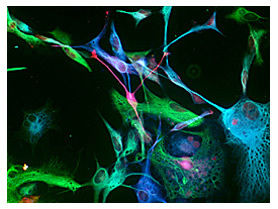 Human brain progenitor, cultured cells immunocytochemically stained for GFAP (blue AMCA), Doublecortin (red Cy2), and Nestin (green RRX). The company is located in rural Pennsylvania, near the Amish country, about 40 miles west of Philadelphia. It was started in 1982 by scientists whose education and previous experience included research in cell biology, protein chemistry, microbiology, and product development in immunology. Our goal is to provide other scientists with the newest, largest selection of, and highest quality of secondary reagents, with the best technical and customer services possible. The products are for research use only, and not for diagnostics or therapeutics. They are not primary antibodies, nor are they medical devices. We hope this site will provide not only information about our company and our products, but also answer some technical questions you may have regarding the use of our reagents. Please let me know if you have any suggestions about how we might reach these goals more effectively or about other information you would like to see presented here.